First and foremost, it's my own 'victory'. As mentioned in my older post "A Month Of Bountiful Blessings", I got good news from Australia. This is the day I have been waiting for and this afternoon, I went to the post office to collect my parcel from my friend Delirious Jellybean. I am so happy to receive it. Furthermore, the gift makes its way into my blogging History as the first gift ever from a fellow blogger. Got the email on 18.12.2010 from Yileen who goes by the nick Delirious Jellybean telling me that I was Radhika's Story WINNER (that's how the heading of the email was.) Let me mention a little bit on how I become the winner. I was at her blog one day and read her post on the give-away. She wanted participants to comment on human trafficking. 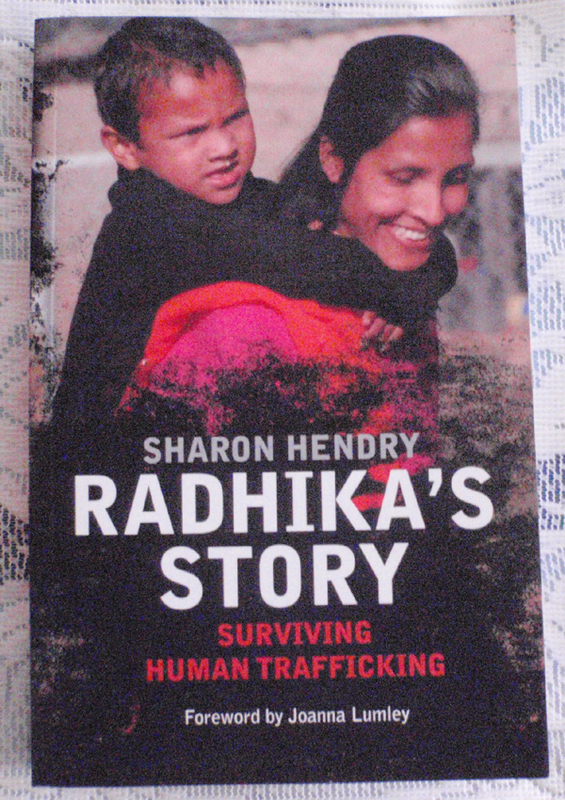 Without hesitation, I tried my luck by responding and giving some comments and summed it up by saying I condemn human trafficking as immoral. It came as a surprise when she told me that I was the winner! Imagine how happy I was! Furthermore, I'm adding another great story to my collections of books. Thank you, Yileen, it means so much to me! The book wrapped in red and a note from Yileen. Also enclosed, a beautiful postcard. 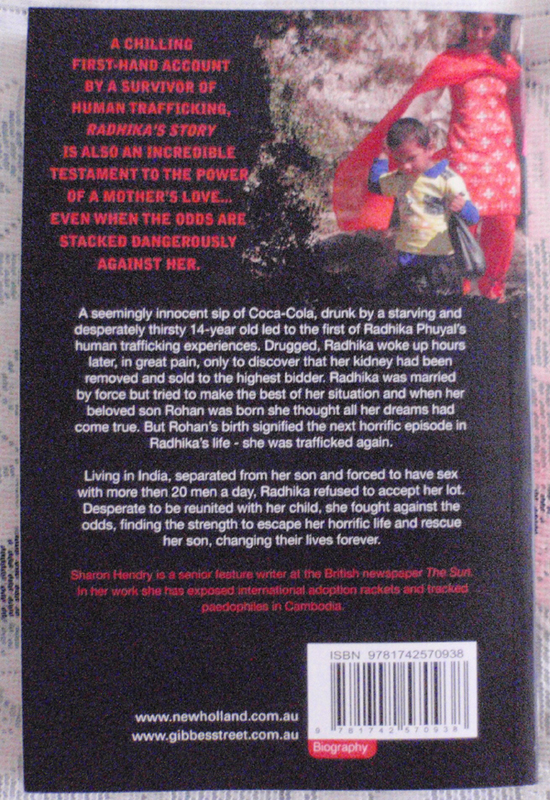 This is the book , front and back (below). Another happy news is Malaysia's national football team victory over Indonesia in the Asean Football Federation (AFF) Suzuki Cup which was held in Jakarta, Indonesia on 29.12.2010. I didn't watch it on big screen in town but watching at home made no difference because I was so restless like a centipede with athlete's foot! Just couldn't keep still because every minute was thrilling and I shouted in joy when our team scored a goal. 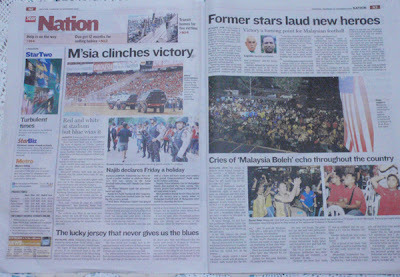 Today, the victory make headlines in all the papers throughout my country. And to add another joy, our Prime Minister declared Friday a holiday to celebrate my country's first ever victory in the championship. Thank you, Mr. Prime Minister! Well, those are the triumphs I am sharing with all of you. As 2010 is coming to an end, I would like to wish everyone a happy and prosperous 2011! It's way far from an Eden so, I would rather call it a place for hangout because this is where I usually go to in the evening or weekends. We have a small space of land at the backyard which we use to plant fruit trees. It has always been my dream to have a large piece of land where I can plant fruit trees of high commercial value like the king of fruits, durian or other types of local fruits. At the moment, we have some rambutan trees which always bear abundant of fruits during its season. A few types of fruit trees. A rose plant that grows among the fruit trees. The rambutan trees. The flesh of rambutan looks like lychee fruit. This is herb which tastes nice. The young leaves can be eaten fresh with sambal belacan (shrimp paste). The flower, bunga kantan, of this plant can be prepared as salad or used in cooking spicy sweet and sour fish. 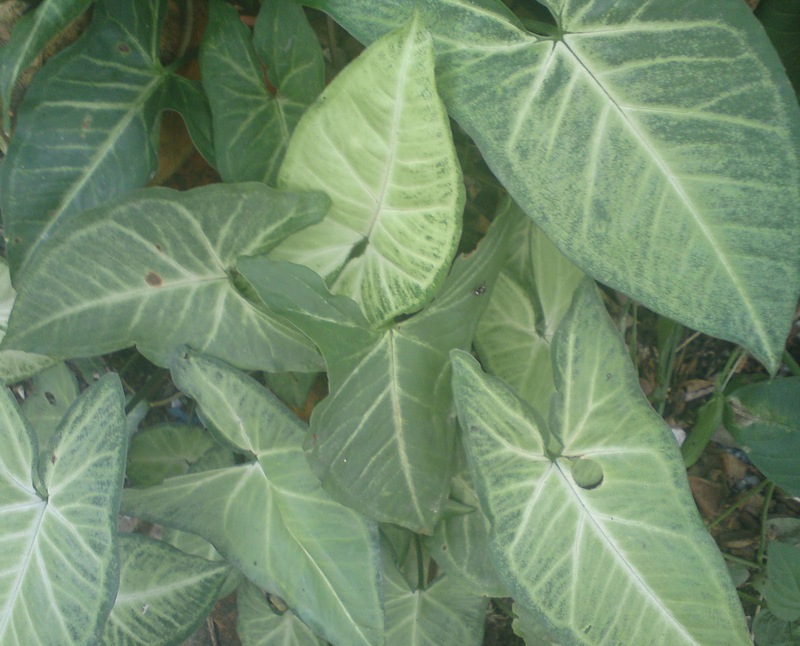 The leaves of this herb has medicinal value for diabetes and hypertension. The leaves can be dried and used for preparing herbal tea. The stripped and spotted bamboo plants were still in polythene bags at the time this picture was taken. 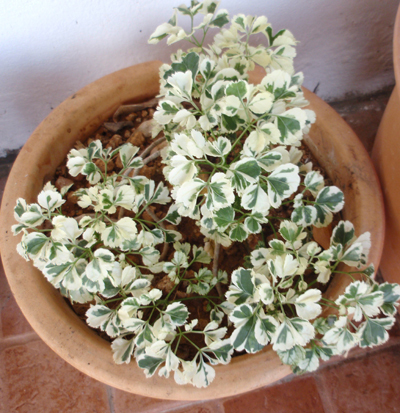 Now, they are growing well in flower pots. A family of the spider plant (Chlorophytum comosum variegatum). Tanduk rusa, in Bahasa Malaysia, literally it's the reindeer's horns. What can be seen here are among some of the potted plants that I have. 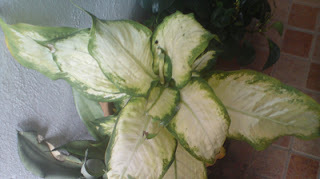 Though a plant enthusiast, I have yet to find out the names of every plant in my compound. Thus, some pictures are without captions. Just have a peek at them, ok? Love is like war : Easy to begin but hard to end. LOVE, a small word but carries thousands' meanings. When in love, everything is beautiful and the feeling is so wonderful beyond description. Love defies all barriers. Come what may, be it crossing the sea of evil, climbing the mountain of thorns, walking the road of dangers or trekking the jungle of obstacles, a madly in love couple could endure all. Like a story; love has its beginning, rising climax, climax and anti-climax. Initially, love is always at its best. It grows and blooms beautifully. Everything is at its extreme feel-good. At most times, the couple are lost in the world of their own. But along the way, some unforeseen circumstances might occur. It affects the warm glow of love to become dim .... slowly. And certain things start to crack. I ever said : Be it the fire of separation nor the evil of temptation will ever separate us. Now, I am wondering how could I ever come up with such a very powerful statement? 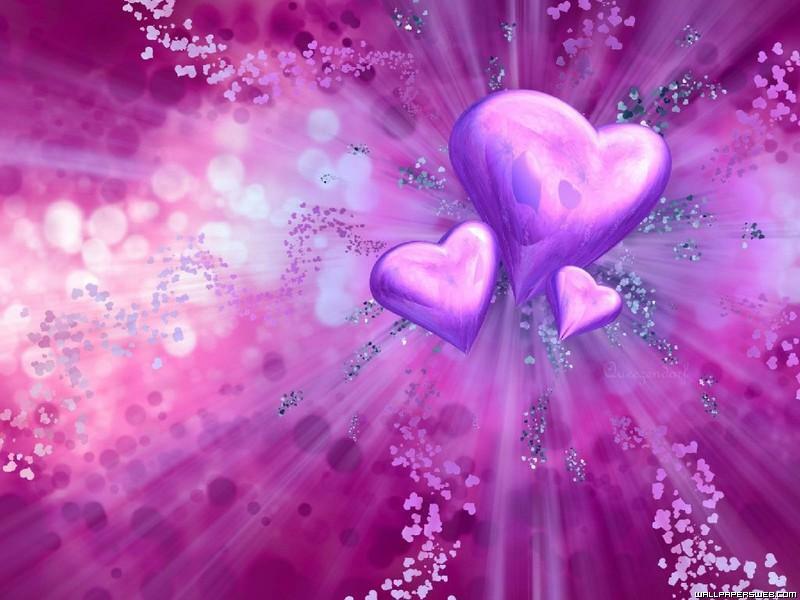 The answer lies in the heart sizzling with love. Enough, I'm not going to elaborate more on this. *My current favourite song, "Just The Way You Are" by Bruno Mars. I am captivated by the beautiful lyrics that talk about love, admiration and beauty of a beloved person. A man from the census bureau was doing a door-to-door survey. He knocked on the door of one house and was greeted by a young boy. The man asked the child if anybody else was home, and when the boy shook his head, he decided nevertheless to try to get the information he needed. "May I know your father's name?" The boy answered. "My father's name is Laughing." Although the name surprised the census man, he pressed on. "And your mother's name?" "Her name is Smiling," the boy replied. The man quipped, "Wait a minute, little boy! Are you kidding? ""No, that's my sister," the boy answered. "I'm Joking!" I feel I am free like a bird. I could fly high looking at the wonders of the world. And be among the clouds! Oh, how wonderful! I am not letting your curious minds wonder wildly at what I am talking about. It has nothing to do with a relationship or career. It is just a wonderful feeling during this weekend. A few things contribute to the happiness. I wish this feeling to go on and on till the end of time. Throughout the week, I achieved some successes which I shared in this blog. I was able to come up with two Haikus which were written right from my heart. I spent a couple of hours on it, letting my brain secreted the best words I could think of to make it appealing and becomes a sweet memory. Why? It is because I could dedicate it to the wonderful and beloved people in my life. OMG! he said that! I replied with a heart beating so fast and so audible to my hearing! "My adorable Elf, you know how much it means upon hearing what you say? I want to hug you right now! If I could love my cats unconditionally (think of their stinky poo but I don't mind), surely I could love you too! Let there be no barrier between our different worlds. You're just another being (though not human). Another creation of God. Love you, Elf!" I saw Elf smiling sheepishly and blinking his eyes unnnecessarily. His ears glowed like maize (according to his master). My words are for real, Elf! Now, now, now, do not jump to conclusion and think that I am a lunatic and madly in love. Should I swear? No, a big girl should not swear. It is more of a motherly love to a child. An adorable child who is always up to mischief yet occupies one part of my heart. And it will always be there. And in my mailbox, there is another surprise waiting to be revealed. A good news from Down Under (Australia). Immediate feeling of wanting to hop like a kangaroo comes to my mind. Whoooa! this is indeed good news! But dear friends, I will tell you about it when the right moment comes. Please bear with me. Be patient! I know someone in Australia is smiling now like I do. :) Thanks a lot, mate. Another surprise, I just logged in Bloggers and lo! I am on Editors' Picks Of The Day! I was like a scurry rabbit quickly going through my emails, yes...there was a mail from Bloggers Team informing me for been featured on Bloggers as one of the Bloggers of the day and my profile and blog has been showcased in Bloggers Home Page. This is indeed a happy Sunday! I am all smiles now. And I am like losing words of thanks to everyone who congratulates me. To date, I have 502 awesome friends at Bloggers and it keeps growing. Indeed quite a big group of friends and I feel the warmth presence of everyone at Bloggers. My heartfelt gratitude to the Bloggers Team for picking me as one of the featured bloggers of the day. You guys are awesome! To summarise it all, I would like to say that I am a very happy person today for what had been mentioned above. And for getting visits from loyal friends and also dear friends who have been missing in action for quite sometime. Apart from that, I get many new friends from all over the globe. When everyone drops by, each brings along big present of kind words and inspirations! My blog is now full of it. What more could I ask for? My heart blooms like flowers and dancing in perfect tempo with everything you guys shower me with! A HUGE thank you and my love for all of you! Melts the cold stone heart. 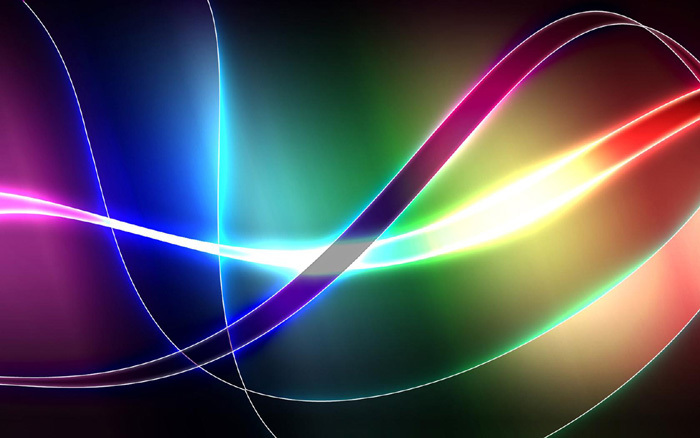 *Literally speaking, we go through many colors of life. Each one has its own meaning. great arts in literature. My buddies, Moonomo and Odliam of US, Harish of India, Stephanie of Philippines and Krislin of Singapore, this is my humble dedication to all of you but it comes right from my heart. Thank you for being my friends. To dance with life's music. historical meeting was erected on the site in 1967. 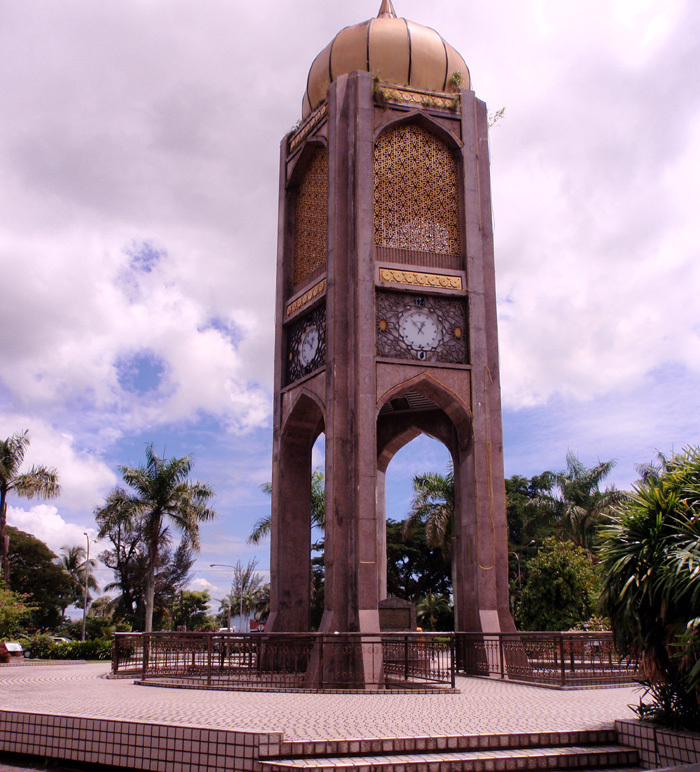 Bintulu played a very significant role in the history of democracy in Sarawak. On September 8, 1867, it became the first meeting venue of the State Legislative Assembly, the Council Negri. With Charles Brooke, the second white Rajah of Sarawak chairing the meeting, there sat five of his British Officers namely James B. Cruickshank, William H. Roadway, Alfred Gouhton, Thomas S. Chapman H. Nelson and 15 Malay and Melanau members (Chiefs) to mark a new era to conduct the state's affairs. During the inaugural General Council Meeting, the most brought up agenda in connection with the General Procedure was more on the maiden speech by the Tuan Yang Di-Pertua. The second General Council Meeting was held in Sibu on 15 June 1868 and the third was held in Kuching on 11 October 1970. From then on, the meetings were held in Kuching at His Majesty's Istana (palace), which was the official resident of Brooke and then later the meeting was held at the Courthouse building once in three years until 1900. According to data, most of the agendas brought up in the General Council Meetings were the discussion to widen the regional boundary and on the pirates activities. After 1900, the General Council Meeting talked more on the agricultural and financial development of the state. Or star gazing at twinkling stars above. Can't talk but they are smart. with all the harsh words available. whatever that gives life its ugly look. that colours this complicated life. They are special with special abilities. *A short break from home, makes me learn more of what's life all about. The cats' family in the city. Meoowww! 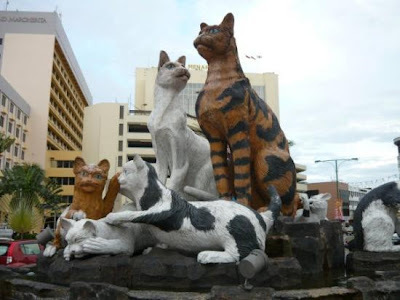 Kuching (literally translated 'cat') is the capital's city of Sarawak. I don't know why it is called as Kuching. Most probably, cats were found in large numbers here hundreds of years ago. Just an assumption. I am here on a short break. Kuching is also like a second home for me because it's a frequent trip here. Furthermore, some family members are residing here. An interesting and very informative site, please log in to get more informations about Kuching. This is one of my favourite poems which I would like to share with everyone. Read this a few years back when I was a student. Actually, it's in the text for one of my courses, Poetry In English. I love reading poetry because it never fails to mesmerise me with the beautiful words of the poets. he becomes a hopeless lover. does not hide the purpose? *The photo was taken by me at Tanjung Batu Bintulu. Let's take a little walk in my little town. Among the small signboards at the promenade. The stork symbolises Bintulu as a coastal town. Part of Bintulu Promenade which stretches from the rivermouth right up to the town. Quite a vast area. A beautiful place to relax or take a walk. The beautiful design under the palm tree captured my eyes. .A billboard in town advertising the world class LNG Port and The Port of BIMP-EAGA. 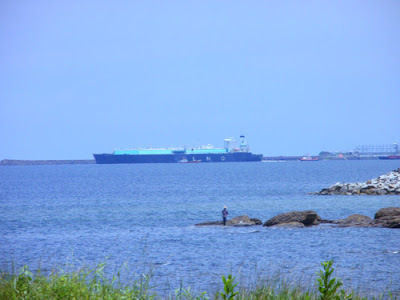 LNG (liquefied natural gas) tanker at the deep sea port. Bintulu is known for its oil and gas industries. 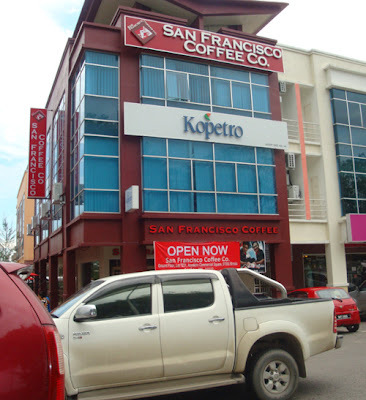 I don't have to walk down the streets of San Francisco to get the taste of that coffee. Among the hotels available in town. The main market known as Pasar Utama Bintulu. The roofs are in the shapes of traditional Melanau's hat. *All photos taken by yours truly, Balqis. It's the end of November. Many things have been going on in my life. Good and bad; but I'll just put aside the bad ones, which were mentioned in some of my posts. Today I am going to highlight the blessings I get throughout the month. 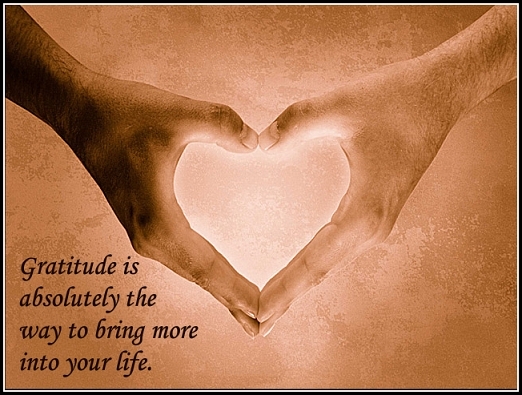 As I used to say, I am counting my blessings, so let it be kept like priceless treasure and fold nicely in one part of my life. They all have a special place in my heart. 1. I am very proud of my nieces achievements this year. 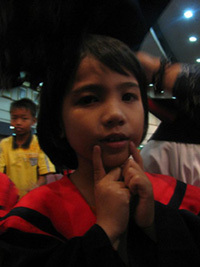 They are in primary schools and excel well in their studies. 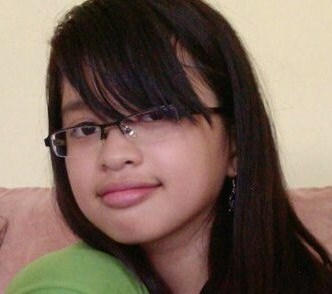 Two of my nieces, both 12 years old, sat for their Year 6 UPSR Examination and achieved good grades in all the 5 subjects. To Nur Syaheerah and Nur Samhana, heartiest congratulations, you made your parents proud and made me proud too. Both of them got 4 straight As, in Bahasa Malaysia Paper 1, Bahasa Malaysia Paper 2, English and Mathematics and 1B each for Science. Next year, they will go to secondary school. For those outside Malaysia, I would like you to know that Mathematics and Science are taught in English. Actually, in primary school, pupils learn 11 subjects altogether but for the Year 6 UPSR, only 5 papers are assessed in their public examination. They are the core subjects only. Other than these two, my other nieces and nephews have their fair share of doing well in school. Izzet, 6 years old, on his 'graduation' day at his kindergarten. 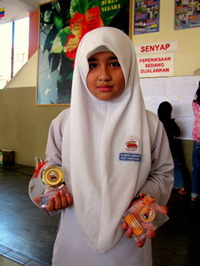 Nur Farhana, among the best achievers in her school. 2. My circle of friends grows as each day passes by. I am getting connected with bloggers friends from other parts of the world. I feel life's so wonderful being able to share so much thoughts, stories, cultures, talks and so on and all these enrich my life. Apart from that, meeting online friends always brings joy to me when I am able to catch up on some chats and jokes which always bring big smile to my face. Goofing around is fun. There's always a little child inside us even if we are grown-ups. 3. These are the gifts from my sister and brother-in-law in Manchester. They are the thoughtful couple who always think of us here. It's not only bracelets, whenever they are back here, we are always pampered with chocolates of various flavours and also perfume for everyone. I love accessories but not too bold. The latest trend is oversize accessories but I am not into it. To me, less is more. I appreciate the bracelets and wear them for formal functions only. Regarding my brother-in-law, we are from different cultures but he is able to cope with us whenever he is here. Of course, he faces the communication barrier with my mom who does not speak English. That is a situation what we call as a conversation between a 'hen and a duck', a typical joke here, because they aren't birds of a feather so, language-wise neither one understands what they talk about. Nevertheless, my mom would talk in our dialect or Bahasa Malaysia with some sign language and he, in English. Somehow, they click well! We are the living translators when both sides seem blur. No, this isn't me. 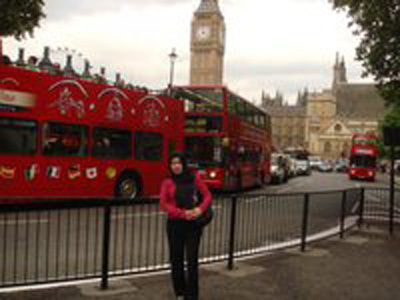 This is my sister in London. 4. 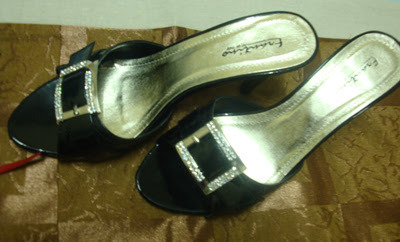 Apart from the above gift, this week, I got an "Influential Blogger Award" from a sweet lady, Stephaine of Philippines. As I said before, I am not in the position to say the person I am or of my character. It's up to friends and readers to "assess" me to be in what category I should be. Thanks a lot to Stephaine. I am touched because she puts her heart into making the award a reality by spending five days working on it. Her touching posts made me cried. I admire her courage in sharing part of her life with us. What more could I say other than my 2-cents and I wish Stephaine a happy and blessed life with her beloved DK. I am not forgetting the rest of my friends. I am extending my deepest gratitude and heartfelt thanks to everyone of you and especially to my bloggers' friends who have, in one way or another, made it possible for me to keep going in this blogging world. Your awards, comments and encouragements have always been a great inspiration to me. Others who help me in the technical side, for your advices and tips, for pointing out my mistakes, you are simply awesome! I need people like you around. You are just like oxygen which I need most to keep me 'breathing' in blogging. To all my followers here and at bloggers, you all mean the whole world to me. You have filled up my days with happiness upon getting your votes, visits and comments. Don't hesitate to give me constructive comments. It will indeed be a boost to improve my style of writing and you can pin-point my typos too. I am open-minded, so don't worry. You won't get bitten for telling me so! P.S. Bahasa means language. Bahasa Malaysia is our national language. English comes as the second language.